See also original Lite plan location on their website! Hosting Ireland offers a range of website hosting packages that will meet everyone’s requirements. If it's your first website, or you require improved reliability and performance we have the right package for you. We provide generous resources and underpin performance with the latest SSD storage technology. Now you can set up professional email addresses rather than settling for using free web mail that doesn't professionally represent you, your brand or business name. You have the flexibility to setup whatever email address name you require, by name, or department for example. All our Linux hosting packages come with cPanel, the industries preferred choice. It's simple and easy to use and you can perform many task and functions yourself. Check out website visitor numbers, download FREE applications and software, setup email accounts and diverts. As you get more experienced you can even move your own websites and amend DNS information. As your business grows we offer the flexibility to easily upgrade your hosting to the next package. Upgrades are quick and easy, and can be done from within your client login area. In addition, you can add other products such as an SSL certificate, spam filtering or website backup. Hosting Ireland helps you look after your website files and our website backup solution means you can backup your website and database so that if the worst should happen you still have your valuable website data. A full restore is simple, only ever ‘one-click’ away. All our servers are located in our data centre in Dublin, Ireland and have Irish IP addresses. IP connectivity is also available through multiple IP carriers. All our servers are monitored 24/7 and protected behind dedicated hardware firewalls. Included in our Business and Enterprise grade web hosting is our priority support package which means you get priority when it comes to resolving your support tickets and queries. Your support tickets are automatically flagged to our support team and given priority over standard support tickets. Google Adwords voucher are available subject to availability. The voucher is the standard Adwords Voucher as supplied by Google and is subject to a spend of €25.00 on a new Google Adwords account at which point Google will top up the customers spend by €75.00. 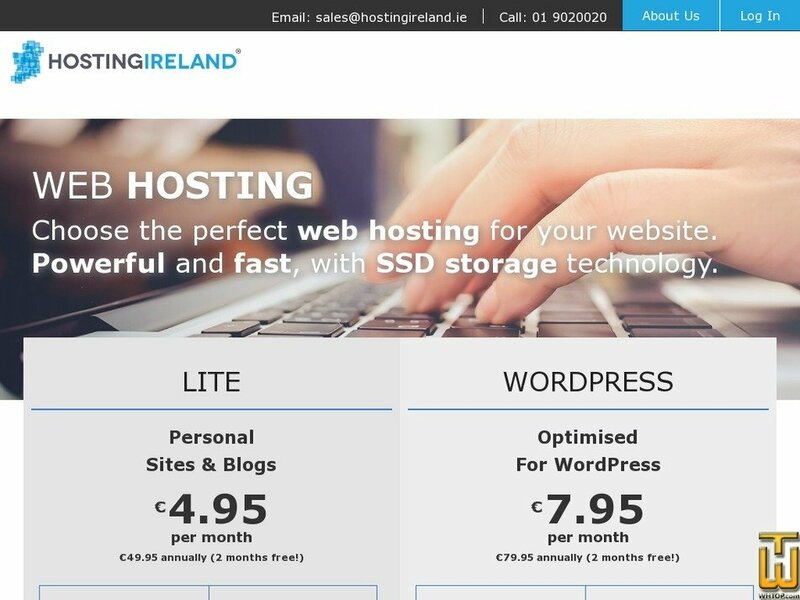 You must claim this voucher by emailing support@hostingireland.ie once you have purchased your hosting. Unlimited web hosting bandwidth emails and subdomains. One Free domain name. Great web design packages. Seo Costs, included in some packages so you save on price. Mobile Web Designers. Price: € 1.99/mo. VAT exc.